Eugene and I adore England. The elegance and eccentricity of the English, their wit and their whimsy. We were overjoyed to be back in this 'green and pleasant land. This is the 2nd of a two-part series describing our adventures on a three week driving tour that included Winchester, Bath and Oxford, with wonderful treats en route. The Royal Crescent Hotel is situated on the Royal Crescent, a crowning glory of Georgian Bath. 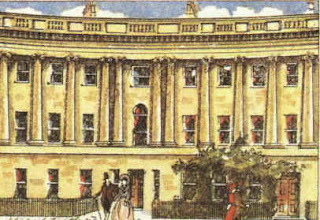 A semicircular terrace of magnificent houses, The Royal Crescent was built between 1767 and 1775. Originally wealthy socialites would rent the houses for the season, when everybody who was anybody came to Bath to take the waters, socialise and parade their finery. The pavements in the terrace are very, very wide. One can imagine the women in their voluminous skirts sauntering along this wonderful promenade. All the nodding, smiling, and social manoeuvrings. We found we had been allocated a suite. In high season, such accommodation would certainly not have been available at a moment’s notice. Also the price would have been quite different. It was autumn when we were there. What would all those 18th century socialites have thought of us? The suite was beautifully appointed, fine linens and the décor understated. A terrace lead off from the sitting room and overlooked the delightful garden. Dinner was served in The Dower House, which is a smaller house built on the estate of a larger one and part of a widow’s dower and intended to be her residence. The dress code at the time was jacket and tie. We crossed the beautifully kept garden towards the Dower House. The restaurant was quietly elegant. The crystal and tables settings sparkled in the subdued lighting. Voices were muted and waiters moved soundlessly around the room. Dinner was exquisitely presented. A delicious crayfish bisque and Dover sole served with seasonal vegetables as the main course. The sommelier recommended a delightful Chablis Premiere Grande Cru, which sang on the palate. We lingered over a light fruit dessert and then had an excellent Stilton cheese served with Tawny Port. Coffee was served in the drawing room. The restaurant and the dinner were superb and we decided to have dinner there each night. We would strike out during the day. Spartan living was definitely not for us. Our monk’s cell seemed very far away. Each morning we would breakfast on our own lovely terrace and strategise, wanting to see as many of Bath’s treasures as possible. Time was precious! First we explored the Royal Crescent. The houses on the terrace are magnificent. At No.1 Royal Crescent there is a grand Palladian townhouse superbly restored, refurnished and redecorated in the minutest detail of its 1770 splendour. It is a designated World Heritage Building and now a museum. All the staff dress in period costume and one could easily imagine what living in Bath was like in its glory days. Even today the Crescent is considered a very exclusive and fashionable address. The tour buses drive gingerly around this oh so special semi-circle. Tour operators have to turn off their microphones to preserve the genteel atmosphere. All a bit quirky. Like Rome, Bath is famed for its seven hills. Easy to say, but walking around the very compact city centre is a strain on one’s legs. We just meandered. The ancient Roman Baths, the soul of Bath, are fascinating. Surely 2000 years is old enough to be considered ancient in Britain? They are built around a natural hot spring that rises at 46.8 degrees centigrade. The buildings were left to decay after the Romans left. At the beginning of the 18th century, after a visit by Queen Anne, interest in the baths was reawakened. The Great and The Good came to take the waters and so began the era of fashionable leisure in Bath. We loved the Roman swimming pool and the Great Bath. The remains of an ancient temple evoke such pictures and imaginings of the glory that was ancient Rome. All those Roman men and woman in their robes and their decadence. We would stop for a light lunch. We discovered Sally Lunn’s Refreshment House and Museum. An absolute delight. It is the oldest house in Bath. In 1680, Sally Lunn worked in this charming building and created the legendary Bath buns. The staff wears period dress. In spite of this, the restaurant is not a noisy tourist trap. 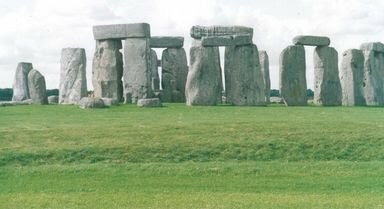 Another day we visited Stonehenge. It is a comfortable drive from Bath. How excited and intrigued we were to see this mystical place of Druid worship. How did the stones get there? Who on earth could have carried these massive slabs and placed them on top of each other? We were dismayed to see how commercial it had become. There are ticket booths, covered walkways and people selling gifts and souvenirs. What a pity. Still it remains mysterious and possessing of a certain energy. 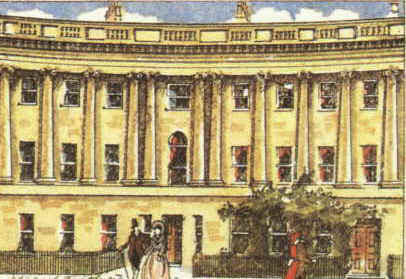 Jane Austen spent some years in Bath. We continued on our Jane Austen literary quest. She lived in Bath from 1801 to 1806 before she went to Hampshire. The city remains much as she knew it then. She set two of her published novels, Northanger Abbey (completed in 1803) and Persuasian (written in 1817) in Bath. One can sense Jane Austen living in and enduring the suffocating confines of its society. 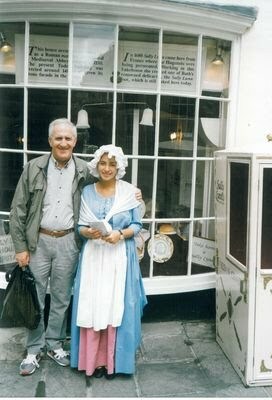 We visited the Jane Austen Centre in Gay Street. Lovely to wander through her life. Time flew by. The ‘dreaming spires’ of Oxford were beckoning and our hosts marked the route on our map. As our luggage was taken to the car, we strolled out to be met by a battery of cameras and media people! Oh my goodness, what was this all about? Our cover was blown. We had come on this trip without contacting any friends or family. Now they would see us on the 9 o’ clock News! We attempted to shield our faces as we scuttled to the car. We learnt later that there was to be a conference of Labour ministers in Bath and that they had booked the entire Royal Crescent Hotel. We never did find out whether we made the News. For me, Oxford is the stuff of dreams. I felt such happiness just being in the city. Matthew Arnold’s ‘sweet city.’ Where the Thames is called the Isis. The good people at the Royal Crescent Hotel suggested that we stay at the Randolph Hotel on Beaumont Street. They telephoned ahead and booked our accommodation. We had been allocated a suite, the Balliol Suite. An appropriate name in this wonderful university town. The Randolph is situated in the heart of the city, opposite the Ashmolean museum. The Ashmolean, attached to the University of Oxford, is the oldest museum in Britain. It was first built in Broad Street between 1678 and 1683. (Just old enough to feel at home in Oxford!) The present building on Beaumont Street dates from 1845. We had a perfect view of the Ashmolean from our room. The hotel is really splendid. Again we realised the benefit of travelling in the off-season. The reception area is panelled in dark wood and the concierge was dressed in full morning suit. This was going to cause us much confusion. The system is to leave one’s car keys with him. The car miraculously disappears and reappears when required. There is a large sweeping staircase and all the public areas are very grand. Immediately I saw the drawing room, I felt a sense of déjà vu. Of course, a scene from the film, Shadowlands, starring Anthony Hopkins and Debra Winger had been filmed there. It is the story of C.S.Lewis who lived in Oxford. It traces the great and tragic love that he found in later life. He describes it so poignantly in his work ‘A Grief Observed’. Over fifty years ago, CS Lewis wrote the Chronicles of Narnia. Ever since, ‘The Lion, The Witch and The Wardrobe’ has enchanted children and adults everywhere. I remember reading it to my now adult daughter. How we both wished we could walk through the back of a wardrobe and find an enchanted land. The names of the colleges in Oxford resonate with history and pedigree. We could not wait to explore. We had arrived in Oxford in early evening. We asked the concierge if he could suggest a restaurant nearby for dinner. He recommended the Elizabeth Restaurant at 82 St Aldates. A reservation made by the concierge at the Randolph would certainly carry weight. We felt so grand. The Elizabeth is elegant and unpretentious, very popular among succeeding generations of students at Oxford University. There were not many people dining that evening. The atmosphere was quiet and civilised. Strangely enough, Spanish motifs predominated. We relaxed over an excellent meal. Full- bodied beef consommé, followed by our perennial favourite, rack of lamb. It was tender, succulent, and just the right shade of pink. Delicious! I chose a crème brûlée as dessert. An amazing treat was in store. It was the finest crème brulee that I had ever eaten. I mentioned this to our waiter whose chest then seemed to puff with pride. In a rich Spanish accent, he told us that his ancestors in Spain had made the first crème brûlée. They had put a crème caramel in the oven to bake and it had burnt. There had not been time to bake another, so they had served it in it’s burnt state and voila, crème brûlée was born. We had heard the story of a burnt crème caramel before, but we chose to believe his version. The next day, we descended the sweeping staircase of the hotel and asked the concierge, all dressed in his magnificent sartorial splendour, to bring our car to the front of the hotel. We heard a very plummy accent, a very indignant plummy accent; snap “I am not the concierge.” Oh my goodness, he was a guest at a wedding reception being held at the hotel. The morning suit that he was wearing seemed identical to the dress of the concierge. To further confound us he been leaning against the concierge’s desk. We fumbled our way through an apology, but our ‘aristocrat’ just stalked off in high dudgeon. Would we ever understand the foibles and fancies of the English? How do they put up with us? Suitably chastened, we decided to walk and hurried out. We did not dare another attempt at calling for the car that day. The romance of the names of Oxford’s university buildings and colleges! I had read about them, seen pictures of them, imagined them and now I was here. Where to begin? We decided to explore Christ Church College first. It is said to be the largest and most spectacular of Oxford’s colleges. Cardinal Thomas Wolsey founded it in 1525. The Reverend Dodgsen lived in Oxford and wrote his famous ‘Alice’ books there. There are quaint shops dedicated to selling ‘Alice in Wonderland’ memorabilia. Visitors to Christ Church College are not permitted to go through the main entrance. We used a smaller entrance down St Aldate’s. We joined a tour led by an Oxford graduate student. He was interesting and entertaining. He referred to Cambridge University as ‘the other place.’ The rivalry between the two venerable institutions extends far beyond the annual boat race. We were introduced to a Bull Dog. No canine this, rather a man in a dark suit and a bowler hat. His role is never quite spelt out. It seems that he admits the students as they enter the college and vets who comes and goes. A great Oxford tradition. We saw the magnificent Great Hall, the college’s dining room on the south side of Tom Quad, the largest quadrangle in Oxford. We walked through the Christ Church cathedral, the smallest cathedral in the country. It has sturdy Norman columns and beautiful stained-glass windows, one of them showing the murder of Thomas Becket. We explored the Picture Gallery, which has a small collection of Renaissance art. By this time our feet were aching so we broke away from the tour and limped back to the hotel. So much more to see! It would have to wait for another time. The next day, we braved the perils of the concierge’s desk and asked for our car. We were going to visit Blenheim Palace, 13 kilometres from Oxford. 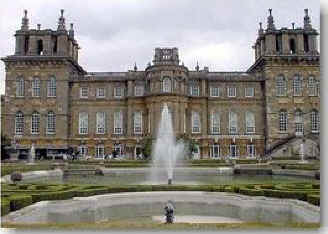 Blenheim Palace is the home of the Dukes of Marlborough and the birthplace, on 30 November 1874, of Winston Churchill. The great country houses of England were such ‘power houses’ of the British Empire. We love the history! It was in the gardens of Blenheim that Winston Churchill proposed to Miss Clementine Hozier during the summer of 1908. I adore the romance of the story. Theirs was a great and enduring love, at times tumultuous. 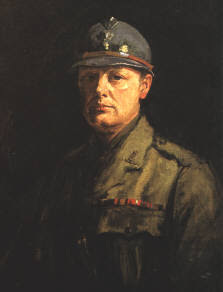 Sir Winston Churchill’s love of Blenheim remained to his dying day. When he died in 1965 he was buried, according to his wishes, beside his parents Lord and Lady Randolph Churchill, in the nearby churchyard at Bladen within sight of Blenheim. When his ‘darling Clemmie’ died in 1977 she was laid to rest beside him. The Palace is set in 2100 acres of beautiful parkland, which was landscaped by Lancelot ‘Capability Brown. Many gardens of the great homes are testaments to his extraordinary craft and skill. Just north of the house there is a dramatic artificial lake with a beautiful bridge created by Sir John Vanbrugh. He and Nicholas Hawksmoor designed the Palace. The interior of the Palace is a baroque fantasy. The paintings and tapestries are exquisite. We loved the intricate detail and delicacy of the carvings. The hand painted ceilings, the amazing porcelain collections and fine antiques allow one to realise the scale of the grandeur. The aristocrats and landed gentry lived lives of splendour and privilege. It is a shame that the upkeep of these great homes forces the owners into commercialisation. Guided tours and gift shops provide revenue. The huge benefit is that we get to see the inside of these places. So great was Winston Churchill’s love and attachment to the place of his birth that it came as no surprise to see a view of Blenheim in the place of honour above the fireplace of his study at Chartwell. 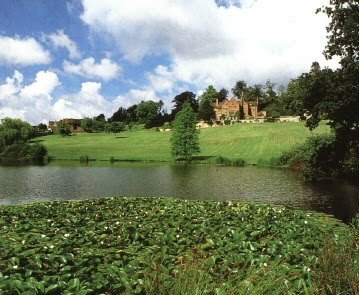 Chartwell was Winston and Clementine Churchill’s home for 40 years. We visited this lovely old home in Kent on a subsequent trip. The architecture is unremarkable. Churchill made many additions to the original Tudor building. The interior is very much as Winston and Clementine left it. Clementine decorated the house in contemporary 1920’s style. The walls and ceilings are decorated in plain light colours. Flowery chintz curtains in the Library and Drawing Room and emerald green in the Dining Room provide colour and contrast. The Drawing room is comfortably furnished with sofas and armchairs covered in pale fabrics. The overall picture is one of elegance and great comfort. Churchill was a talented artist and many of his works adorn the walls. The home overflows with books, personal mementos and great, detailed maps. His talents are legion. He adored landscaping. He was a master bricklayer and very proud of his building skills. He landscaped and planned his garden to ensure the best views. There he could relax, build a wall, feed a duck or simply lose himself in the beauty of his magnolias and contemplate the past and plan for the future. The sight of a solitary chair in the garden marking the spot where he sat and painted entranced me. I could imagine him hunched over his canvas with the inevitable cigar in his mouth. How he loved his cigars. Writing was central to his life. His memoirs, great historical and literary works are displayed in the bookshelves in his study. Here he dictated his famous speeches. He would practice reading them and would try them out on guests round the dining room table at Chartwell. These guests included eminent politicians, journalists, writers and artists. Invariably there were at least twenty people sitting around the circular scrubbed oak tables. The chairs were also of scrubbed oak and made to Churchill’s own specifications. He insisted that they should have arms so that his guests could have great comfort when sitting at meals. Winston and Clemmie adored cats. They had a much-loved marmalade cat, Tango. The English artist, William Nicholson was a regular visitor to Chartwell and a wonderful influence on Churchill’s painting. While staying there in 1933, he painted the Churchills taking breakfast in the Dining Room. Tango is pictured sitting comfortably on the table being fed by Clemmie. We left through double doors housed in an elegant eighteenth-century wooden doorcase. There are huge brass rings on each door and beautiful carvings above. We tramped around some of the great colleges. Magdalen College is reputed to be Oxford’s wealthiest and probably most beautiful. The cloister with its strange gargoyles and carved figures is said to have inspired C.S. Lewis’ stone statues in the ‘Chronicles of Narnia’. Oscar Wilde and the poet laureate, John Betjeman were students at the college. We visited the 16th Brasenose College, which has charm and elegance perhaps lacking in its more famous neighbours. J.R.R. Tolkien taught at the small, smart and affluent Merton College. Another literary giant associated with this college is T.S. Elliot. Each college is famous and beloved by those who attend them. The Bodleian Library is one of the oldest public libraries in the world. Known to Oxford scholars as “Bodley” or simply “the Bod”, it is one of six copyright deposit libraries in the United Kingdom. We had joined a tour and were fortunate once again to have an Oxford graduate student as a tour guide. Naturally students dominate the scene in Oxford. They cycle everywhere, always at a frantic pace, their black gowns billowing out behind them. They look like great black birds flying along. There are parking areas for bicycles. It is not unusual to see at least fifty bicycles lined up next to each other. They all look so similar, yet there is total order and no mix-ups. Another Oxford tradition. So soon it was time to leave. Reluctantly we left the rarified atmosphere of the Randolph and drove to Heathrow. Our English idyll was over. Farewell to Shakespeare’s England. ‘This royal throne of kings, this sceptered isle’. Click here to read the first part of 'Oh To Be In England'. Roman Baths Museum Abbey Churchyard, Bath. Special thanks to Ian Shaw of The National Trust Photographic Library. I'm glad I discovered your Blog and will be back soon. I can't seem to find an option to 'follow' your blog? Hi Karen, Thank you for your kind comment. If you wish to follow my blog, I can include your email address in my group email which I send out every time I publish a new article. Email me at les@leslieback.co.za and I will add your address to the group email list. This list is kept confidential.